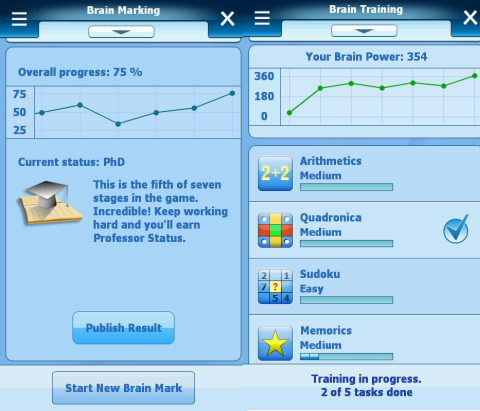 SPB Brain Evolution is an intellectual software game that helps to train the brain and improve memory, logic, arithmetic, and puzzle-solving skills. The application is a suit of 12 games, which have to be played in sequence: only good results in a game, unlock the next one. Watch the below video to sneak a peek on how the game is organized and what benefits it offers to the users. BlackBerry Phones will run Android Apps? iPhone 5 and iPad 2 Specifications? Samsung Star II S5260 Phone Launched! How does 4G Network Change your Life? Verizon iPad will be Launched soon! WP7 ROM for HTC HD2 Released! Verizon iPhone 4, Whats New? Rebellion Rise, a WP7 Game Launched!